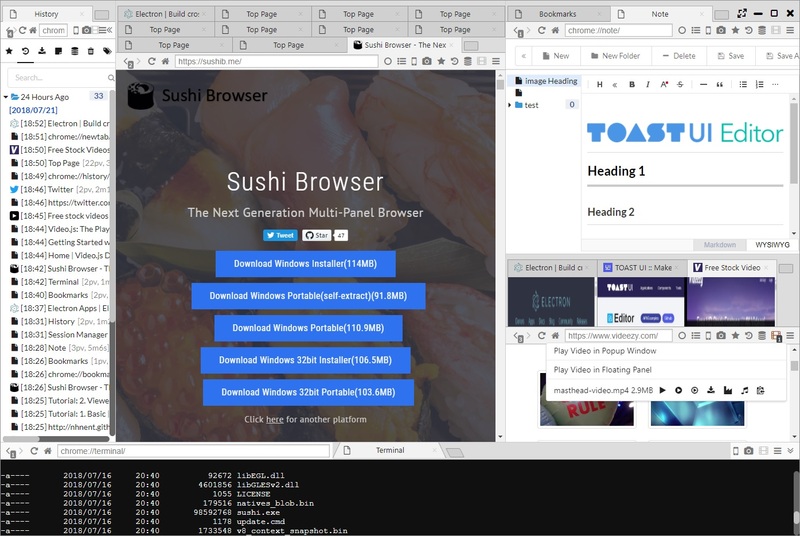 "Maximize the web browsing efficiency", it is the concept of "Sushi Browser". Regarding the various functions of the browser, please refer to "Tips". We will introduce this panel's greatest feature, the "multi panel". Please check here for more detailed functions. For more detailed function, please check here. The panel can be divided by dragging the tab towards the corner of the panel. It can also be divided from the right click menu on the tab as well. You can open favorite pages or pages from your history using the side bar. The side bar can display web pages same as common panels. Once it detects a video existing on a web page, the video icon on in the toolbar becomes red and allows video download and replay. Also downloading a streaming video (.m3u8) or a batch video download are available by using youTube-dl. If you select "Play Video in Popup Window" from the context menu right clicked on the video being played or from the menu displayed after clicking the video icon, the video will be cut out as a popup window or panel. Varieties of control and setting are possible with mouse and keyboard like video player onto the videos being played. Mouse wheel control is assigned to Seek, Double-click is assigned to full screen mode as default. Multi-row tabs can be used in the Sushi Browser. And ordinary tabs can be switched to Multi-row tabs from the main menu. Vertical tabs can be used in Sushi Browser. Vertical tabs can be displayed from the sidebar icon of the menu bar. It's also possible to hide ordinary tabs when displaying vertical tabs. Equipped with a native-implemented high speed advertisement block. It is possible to set up the validity or invalidity in all page, each tab and each domain from Main menu. This will be a tab where it uses anonymous networking system "Tor". It makes network with high anonymity possible. It does VPN search with MS-SSTP VPN by using VPN Gate service. This browser is equipped with various convenient features other than above function. Please check here about using Flash. This browser has a session control system that preserves the condition of the window of browser and tab at regular interval and plays. There is also a function for the recover of tab like a tab trush and a tab record. ・Parallel download: For 1 file it can download with a maximum of 16 parallel downloads. ・Download All： You can do bulk download links and media files on the page. 1. Terminal: It can operate Bash for Linux/Mac and Power Shell for Windows. 2. File explorer: It can manage and browse files. 3. Text editor: It can edit text and source codes etc. 4. Video playback: It can be used for automatic playback of videos. It features a powerful search function such as searching a selection range and simultaneous search with multiple search engines. Sushi browser is equipped with an editable note (memo) function in WYSIWYG format (edit as seen) and Markdown format. You can choose between installation version and portable version. It is possible to set up the keyboard shortcuts and mouse gestures for 100+ functions. Screenshots of the whole page or a selected area can be made. In addition to the search function of Chrome, OR search and regular expression search can be performed. It is also equipped with "Search Highlight" function. There are functions such as "Fullscreen mode" and "Always on top". ・Bind Selected Window： The function to bind other windows on the tab and control like the application in the tab. ・Mobile Mode： You can change the user agent and display the page as mobile or another browser. ・AutoPagerize： It can automatically read ahead websites that spans several pages. iWith automatic operation assist functions such as iMacros and IDE, we have implemented an API compatible with Puppeteer (automation in headless Chrome) API. 1. Added "Arrange Panel" function. 1. Added form input history function. 2. Improved to detect mobile panel. 3. Added setting to enable video operation only for URL matching regular expression. 4. Improved auto-suggestion of address bar. 6. Updated to youtube-dl 2018.09.01. 4. Fixed bug related to status bar. 6. Updated to youtube-dl 2018.08.22. 7. Updated to inferno.js 5.4.2. 8. Updated to xterm.js 3.6.0. 9. Fixed a lot of bugs. 11. Fixed a lot of bugs. 2. "Maximize Panel" is added to the right menu of the tab. 4. Add password to import / export settings. 5. "Show the favicon at the left end of the address bar" added to setting. 6. "Show bookmark add icon on the right end of the address bar" added to setting. 9. Updated to youtube-dl 2018.08.04. 4. Added "Maintain fullscreen mode even after page transition" option. 1. Opened the Sushi Browser Tips page (https://sushib.me/tips/). 2. Improved mobile mode so that user agents of various browsers can be selected. 1. Added line number to markdown mode of Note. 2. Added a button (P) to switch the preview mode in markdown mode to tab or vertical. 3. Added button (L) to change markdown line wrapping setting. 4. Fixed bugs related to Note, improved operation. 5. "Sort history in descending order of PV" is added to auto complete setting. 7. Fixed bug that can not delete theme. 8. Fixed a bug in bookmark drop. 9. fixed Bug of bookmark import. 10. Fixed many download bugs. 11. "Almost the same as as Chrome" was added to "When closing current tab, focus". 12. Fixed bug that Audio Extract, and Video Converter do not start. 13. Fixed Search Highlight bug. 14. Fixed some other bugs. 2. Updated to infernojs 5.3.0. 3. Updated to xterm.js 3.4.0. 1. Improved behavior of private tab and Tor tab (top page is displayed, etc.). 2. Change all private tabs to same session. 3. Changed to discard private session when all private tabs are closed. 4. Added items for keyboard shortcuts. 5. Added items for mouse gesture. 6. Added function to output file with Plain Text on Note page. 7. Improved display of setting page. 8. Changed data deleting range of session manager. 9. Improved to be able to delete data by right clicking on the period folder in the session manager. 10. Changed the margin between list items in the sidebar. 11. Updated to Muon 7.1.5. 1. Fixed WebExtension function bug. 2. Updated to youtube-dl 2018.07.04. 1. Added function to add selected text (HTML) to Note. 2. Added Note function to tool page. 3. Improved to be able to set the range for deleting data. 4. Added deletion function to history page. 5. Added function to display Tor process progress in the location bar. 6. Improved to restore active tab when session is restored. 7. Added option of Show Focus Location Bar of Top Page. 8. Updated to Muon 7.1.4. 9. Fixed bug that chrome extension setting disappears when changing file location. 10. Fixed display defect of multi panel function. 11. Fixed Tor tab's webrtc leak. 12. Fixed a lot of bugs. 4. Added option to set margin at top of tab bar when unmaximized. 5. Added a function to change the top frame color when the window is out of focus. 6. Updated to Muon 7.1.1. 7. Fixed a lot of bugs. 1. Fixed a fatal bug in chrome extension. 1. Improve to recreate scroll position when tab restoration. 2. Improved to restore all windows after exiting / restarting browser when "My windows / tabs from last time" is selected. 3. Added Send to URL function to "Settings> Context Menu" (function to send URL to new tab or command). 4. Improved to memorize last selected file, delimiter position with memo function. 5. Added "Circulate Tab Selection" option to "When scrolling over the tab-bar". 6. Added "Display Current Preview" option to "Tab Preview". 7. Updated to Muon 7.0.6. 8. Updated to youtube-dl 2018.06.14. 9. Fixed bug that pdf download error. 10. Fixed a lot of bugs. 2. Added a tab trash box(closed tab history). 3. Added tab trash box and download menu to sidebar. 4. Added export / import function set to "Settings> General". 5. Added control option for auto display of download list in "Settings > General > Enable Bottom Download List". 6. Change the layout to divide the session manager by folder every elapsed time. 7. Fixed a problem that volume change function does not work in iframe. 1. Fixed fatal bug of tab detach. 2. Added 'Quit Browser' to Main Menu. 3. Added 'Search Methods' Option to Search Setting. 2. Added Bookmark Add / Delete Menu in Bookmark Bar. 3. Added option 'Show bookmark bar on mouse hover' to main menu. 4. Added advanced setting option of tab preview. 5. Bug fix for search engine settings. 6. Added option to set window icon. 8. Added pin function to Top Page's Speed ​​Dial. 1. Added setting "Keep value ​​in LocalStorage" when volume is changed by seek operation. 2. Added home button and homepage setting. 3. Added change setting of volume and speed increment by mouse wheel. 4. Added "Main menu > More tools > Ask where to save each file before downloading"
5. Added mouse gesture that restart, search within the page, close left or right tabs, move left or right tab. 6. Added ON / OFF setting of mouse gesture from extension page. 7. Updated to youtube-dl 2018.06.02. 8. Fixed a lot of bugs. 2. Expanded available range of movie manipulation functions by clicking and scrolling. 3. Improveed to display percentage in tab title when volume is changed. 4. Apply minify to all files. 5. Fixed fatal bug when tab dragging. 1. Changed the display order of the video list so that the new one is above. 2. Changed to attach no-audio prefix and audio-only prefix when detecting video. 3. HLS Movie download argument change. 4. Changed to be able to transition to the unmuted state by clicking the mute icon except during movie playback. 4. Changed default behavior of page zoom to 10% increase / decrease. 5. Added pop-up that displays zoom ratio when page is zoomed. 6. Added setting of whether Chrome extension icon is displayed on address bar or background(displayed when main menu is opened). 7. Changed default display of Chrome extension icon to address bar. 8. Added setting to open new tab at left end or right end. 9. Added built-in mouse gesture ON / OFF setting. 10. Fixed a fatal bug at page search. 1. Fixed a fatal bug when closing Window. 2. Added browser restart to main menu. 4. Updated to youtube-dl 2018.05.18. 1. Improve the volume icon so that it appears on the tab when playing videos. 2. Added function to switch mute status by clicking volume icon. 3. Added function to change volume from 0 to 800% when mouse over volume icon. 4. Changed to disable Auto Highlight when closing search window. 5. Changed Auto High Highlight's default behavior to Highlight only to the next page. 6. Added option of whether to auto highlight recursively. 7. Changed default behavior when opening links on sidebar and toolbar to open link on current tab. 8. Added setting to open links on sidebar and toolbar. 9. Changed to be able to open links on sidebar and toolbar with middle click. 10. Added setting to open bookmark bar link in new tab. 11. Added Session Manager to sidebar. 12. Improvement of Automation Center. 13. Fixed a lot of bugs. 14. Updated to youtube-dl 2018.05.09. 2. Changed Pin Tab behavior to be like Chrome. 1. Added browser auto-operation function. * This is an automatic operation solution like iMacros or Selenium IDE. It is realized by implementing an API compatible with Puppeteer (Headless Chrome Automation) API. Please refer here for the implemented API. 2. Fixed Bookmark and Favicon Import bug. 4. Change display method of dialog(window.alert). 1. Improve display of main menu. 2. Fixed bug that 'Bind Selected Window' does not work on Windows. 1. Improve tab open performance. 2. Changed the selection method of user data folder in portable version. 2. Files are saved ./resources/app.asar.unpacked/resource/portable .